look more like raccoons than a bear. 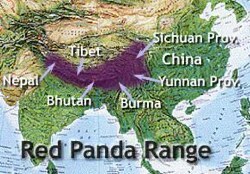 Recent studies of the pandas chromosome and protein characteristics found that it is part or bear family Ursidae. It is slightly larger than a large house cat, has rusty red fur, a long light and dark striped tail, a short white nose, and dark tear tracks. Unlike other bears, their claws are partly retractable. 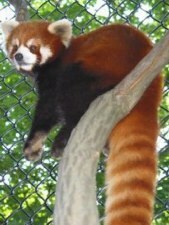 Red Pandas can be identified by their face patterns and are known by 26 different names. They live in the Himalayan Mountains eating mostly bamboo leaves. Red Pandas grasps bamboo stalks with a specialized wrist bone called the radial sesamoid which acts like a thumb. They are secretive and gentle creatures, spending most of the day sleeping curled up with their tail wrapped around their head. 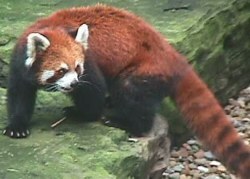 When disturbed, red pandas exhales an explosive whuufff, much like a raccoon. At the same time, they violently arch their bodies to frighten off intruders. . Red Pandas have 1-4 babies when they give birth. The young Red Pandas stay with the mother for up to one year. Their life span is 12 to 14 years.